Why do primary school teachers lie to their students? an intentionally false statement: they hint rather than tell outright lies | the whole thing is a pack of lies. used with reference to a situation involving deception or founded on a mistaken impression: all their married life she had been living a lie. My reading of this is that lying involves an intention to deceive for unscrupulous reasons. For me, the motivation is all-important when we are talking about adults ‘lying’ to children. If adults lie to children to deceive them for unscrupulous reasons, then this is reprehensible and has no place in a classroom (or anywhere else). However, if adults create an imaginary scenario or context for or with the children, with the primary intention of developing their learning, then the motivation is principled and it should not be called lying. I prefer the term make-believe. Non-malevolent lying or make-believe comes in many forms along a continuum: From blatant fabrication, to subtle ambiguity. All involve the creation of an imaginary situation presented or co-constructed by the minds of those participating. This simple diagram illustrates the process. – Everything happens in the real world. – An imaginary situation or context is created. – The participants are required to suspend their disbelief. – Everyone participating is aware that the imaginary situation is unreal. – Two children in the playground agree to play Star Wars. – One represents Darth Vader, the other Obi-Wan. They each grasp a stick representing a light-sabre and begin to fight, making the noise of whooshing blades. – For a few minutes they forget the real-world of the playground (which, nevertheless, does not go away) and are immersed in the imaginary world. – One child cracks the other on the knuckles with her stick. The game stops immediately as the accident interrupts the imaginary situation and makes both children suddenly aware of the real world. “I’m sorry”, she says. The other rubs his knuckles. “Its OK”, he says and raises his stick/light-sabre as a sign for the imaginary situation to begin again. In this example, both participants are making the fiction and participating, moving into, out of, and back into the imaginary situation, as they chose or need to. In drama, the emphasis is put on making meaning. As the actors participate in the fiction, it is done with the intention of conveying narrative, tension, and point of view. In the theatre, in the cinema, on the television, or on the radio, those in the audience are viewing the imaginary world from the outside, in the real world. They are not invited in (unless on special occasions like pantomime, which plays fast and lose with conventions) and have no say over what happens ‘on the stage’. Further, there is a tacit understanding between the audience and the actors that this is make-believe. Although in theatres and cinemas the lights are lowered in the house to push the real world into the background and help the audience suspend their disbelief, there is no message before the show begins explaining that what is about to happen is not real. The human mind seems quite capable of understanding that when Hamlet stands alone on the stage during a soliloquy, he is simultaneously voicing his thoughts in the imaginary world and talking to us in the real world. There is no need for someone to whisper this to us as he begins. The exception to this is when real-life is dramatised, as in a film like Argo. In these cases the film-makers are obliged to make an attempt at conveying the truth and reminding the audience that the film is based on real-life events. Some film-makers do this more successfully than others. Occasionally, as in the famous Orson Welles’ War of the Worlds radio adaptation, actors and directors confuse their audiences by making their drama sound so real that are deceived into believing it is. This is not usually much appreciated and can cause anger. In simulations, the imaginary world is made for others to participate in. In effect, the audience are invited up onto the stage to take part in a drama that has been created on their behalf. Most simulations allow the participants some say in how things develop, but their agency and freedom to act are very restricted. Narrative computer games fall into this category, although some are becoming very sophisticated. Some, have a narrative thread, that also allows a great deal of autonomy. In schools, simulations are sometimes created by adults for the children to participate in ‘immersive’ experiences, such as a WW2 air-raid. They are also sometimes used by museums and visitors centres. In make-believe as drama-for-learning everyone involved is participating, both in the creation of the imaginary situation and in what happens when the fiction begins. This does not mean that those participating have complete freedom and license to take the fiction in any direction they choose. In drama-for-learning the curriculum-learning requirements are always at the forefront and those participating are aware that they involved in an imaginary context with the purpose of developing their learning. For this reason it is paramount that the teacher plans carefully the non-negotiable elements before they begin. In drama-for-learning there is no attempt to deceive or confuse those participating into believing that the fiction they are creating is real. Indeed, the teacher may need to make this explicit from the very beginning so that all the children are completely aware – especially if they are working with very young children. This is easily done and does not in any way spoil the situation for the children. Some adults worry that if the children don’t think it is real they won’t enjoy it as much, or the drama will lack some of the ‘magic’. This is not true and drama where the children are confused about whether it is real or not-real is not consensual and can not be classed as drama-for-learning. In drama-for-learning the imaginary situation is always made explicit, the children are always aware they are in a story, and that they or anyone else can stop the story at any time. In this way drama-for-learning is very close to play. The difference is that learning is the central concern of drama-for-learning and the adult is mediating and supporting the students the whole time in this direction. I’ve left the most controversial of my list of make-believe scenarios until the end. This is because adults can be very sensitive about the stories they invent for children. The big two are of course Farther Christmas and fairies. In both these cases, for most families, children are told these stories as if they are real. I, like most people, grew up believing in Father Christmas. I was less interested in fairies, but Joe 90 and Thunderbirds seemed pretty real when I was four. It was not until I was nine or ten that I put the pieces together and plucked up the courage to ask my dad to confirm my suspicions about the man who came down our chimney. He asked me if I was sure I wanted to know. I said, I did. He confirmed the truth. I was gutted. This is a common enough story and never did me in any harm. Was it a lie? Well, it was certainly a deception, but it was done without malice and for my entertainment. I don’t blame my parents, they were being kind, and when I had children, Claire and I told them the Christmas myth too. They still enjoy it, even though only Ettie still believes (and she has her doubts). But, does this kind of deceptive make-believe have a place in the classroom? I would argue, no. Father Christmas and fairies are stories are told to children as-real not to educate them, but to entertain them. The imaginary situations we create for and with children in the classroom must be of a different kind, they must be explicitly fictional, and used with the intention of developing learning. Children must be aware, from the beginning, that they are involved into an imaginary situation and given as much opportunity to influence and develop the situation as possible. 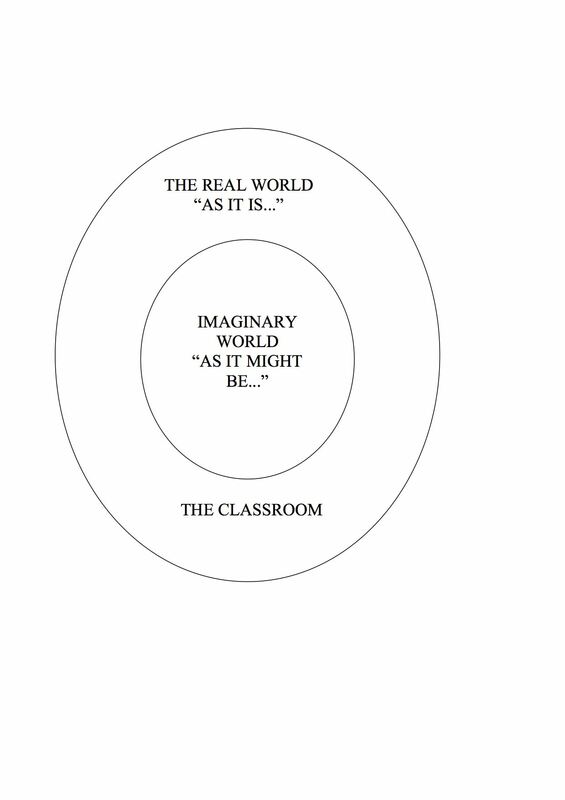 The real-world of the classroom should not be confused with the imaginary-world of the context, however much those participating suspend their disbelief, because the purpose of all situations (real or imaginary) that we invent in school must have learning as their central concern. That’s a brilliant explanation of the different ways we can suspend our disbelief and use make believe for learning and enjoyment. Thanks, Tim. A far more learned and eloquent post than my ramblings, Tim, and such an interesting read. During my GTP training in 2008/2009 we had a fantastic MoE session at Worcester Uni led by the HT of a local school which, I think, uses MoE pretty much all the time across the school. It was fascinating, and I think many of my cohort now use elements from that session in their teaching. I have never really known enough about it to create a true MoE enterprise, but I could not imagine teaching without using drama, role-play and “make believe” scenarios. Well done Tim, pretty well nailed this. It is very important that we don’t lose these approaches in learning. The principle of immersive activity provides a powerful stimulus to a child’s thinking, however provided. You’re right to point out that none of these activities is designed malevolently. It would be a perverse teacher who chose that reasoning. It is sad that you felt the need to write it though. You’d think colleagues would have an insight into each other’s practice. That is part of the teaching standards! I agree with everything that you have written but I still think that there is a grey area with some of the scenarios that are common in schools such as on the Everybody writes site. Those scenarios include things such as a fake alien space ship, a fake burglary (sometimes with police involvement to make it more real) and other such situations. These don’t really come under the heading of children suspending belief as there is a real desire to get the children to see the situation as a real one so that a genuine atmosphere and feelings are created. I think that it is the use of some of these ideas that could lead to accusations of lying to children as they are not always aware that they are in a make believe situation. Thank you for commenting. I agree there is a grey area with any scenarios used in school where the children are not clear from the very beginning that they are involved in an imaginary scenario. I don’t believe it is lying because the adults’ intentions are principled, but these situations are at best ambiguous. Furthermore, there is really no need to trick children into believing what is happening is real. Children engage just as much, more even (in my experience) when they are aware they are in a make-believe and can contribute to the making of the fiction.